Windsor's city council approved two separate projects Monday night, that each involve a piece of the city's history. An artist rendering of a gateway arch that could span Sandwich Street between Paterson and McKee Parks. City council first debated to buy and restore one of the last three remaining streetcars that formerly operated in the city. Streetcar #351 is sitting in the old streetcar shed on University Avenue West. Owner Van Niforos sold the property and must be out by Nov. 9. Mayor Drew Dilkens had RM Auctions and Restorations of Chatham-Kent check out the vehicle. The company quoted the city at a cost between $500,000 and $750,000 for a project that would take about two years to complete. "We're talking about using this streetcar as an active part of our riverfront," said Dilkens, who proposed the trolley become a Riverfront beacon project. Some councillors were unsure if the quote seemed fitting, given that the city was undecided about where the streetcar would go, or what would be inside of it. Some suggestions included turning it into a concession stand. "We need to receive the streetcar but after that, I think there are some steps that need some time," said Coun. Bill Marra, who suggested council take more time to think about options. In the end, the majority of councillors voted to accept and restore the streetcar with some amendments to seek fundraising support and a public consultation on where to put it and what to put in it. The city will give owner Niforos $100,000 in tax breaks for the streetcar. 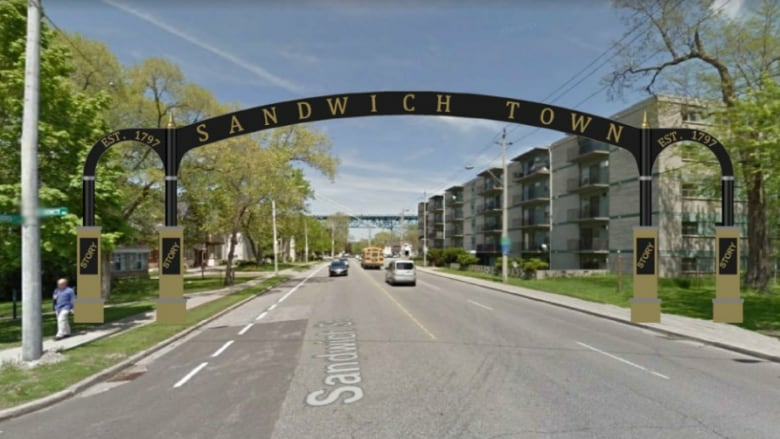 Council approved the 'Sandwich Town Arch' gateway, that's set to span Sandwich Street between Paterson and McKee Parks at a cost of $303,257. The large gateway will feature heritage plaques with local stories of Sandwich as chosen by the public. "I'm proud of it," said coun. John Elliott who said he's heard nothing but positive feedback about the gateway. Council unanimously approved for the project - with construction on the horizon. 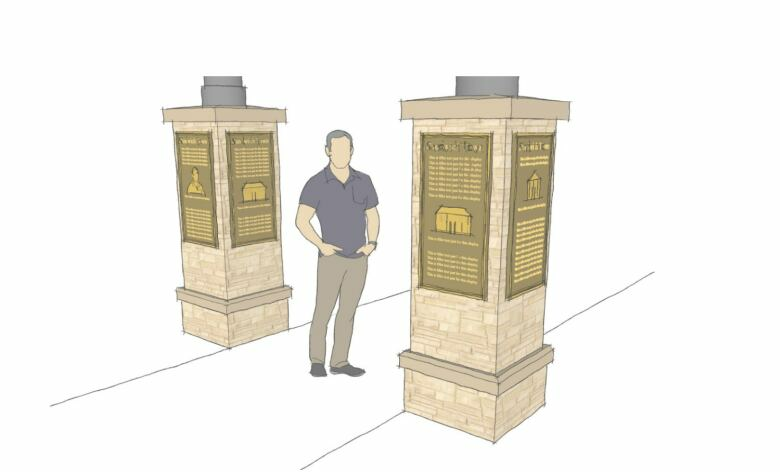 This rendering shows the abutments on the arch that will showcase the historical plaques telling the stories of Sandwich as chosen by the public. The FINA World Championships swimming competition at the WFCU Centre last December brought in about $116,000 for the city. The calculation was made using the Sport Tourism Economic Assessment Model known as STEAM, used to predict the economic impact of hosting an event in a community. Council heard that the surplus could go towards the streetcar project. A formal detailed report from the Canadian Sport Tourism Alliance wasn't heard because a representative couldn't attend the meeting due to a family emergency. Councillors around the horseshoe heard from Windsor's poet laureate Marty Gervais as he gave an excerpt of a poetry reading coming up on Tuesday at Willistead Manor. "These poets will introduce themselves to these individuals and politely and discreetly offer them a book and give them a short reading of the poems, and I know it sounds a little creepy but it's actually done all across the country in literary circles," said Gervais. The poetry at the manor event begins on Tuesday at 7 p.m.